Billiards is a fun and competitive game that is played by millions of people worldwide. And although the name “billiards” is often interchanged with the name “pool,” the two games are actually quite different—as you will see—with different origins and styles of play. In this article we will talk about the game of billiards, pool, snooker and other carom games, or more specifically, we will discuss the history of billiards and its descendants that some say date back to the 15th century and evolved from the game we now know as croquet. The history of billiards is extensive and very rich, involving many transformations and updates through the centuries and decades. The game that we now know as billiards has been played and enjoyed by people of all shapes, sizes, stripes and stations, including royalty and commoners, presidents and citizens, men and women, and an untold number of greedy hustlers who have used their uncommon skills to collectively make millions of dollars off the game. The game of billiards evolved from a lawn game similar to croquet that was regularly played during the 15th century by wealthy folks in Northern Europe and most likely France. Because it was too frigid outdoors to play croquet during the colder winter months of the year, someone came up with the idea to move the game indoors and many, many years later the game of billiards was born. The original billiards (indoor croquet) was played on a wooden table covered with green cloth (to simulate grass) and a simple, crude border was placed around the table to prevent the balls from falling over the edge. In these early days, the billiard balls on the table were shoved rather than struck. Players used wooden clubs called “maces,” which slightly resembled the croquet mallets we know today. The term “billiard,” from the French, either derived from the word “billart”—one of the wooden clubs that was used—or “bille”—the name they had for ball. However, there is ample evidence to suggest that people of all stations had played and enjoyed billiards since its invention. At the beginning of the 17th century, the famous writer, playwright and poet William Shakespeare made mention of the game in his play Antony and Cleopatra. Less than a century later, the first official billiards rule book was released, and a billiards table could be found in almost every wealthy residence. While billiards relied on the mace to shove the balls through the 16th and most of the 17th century, in the late 1600s the cue stick was first developed—almost by accident. Interestingly, in the early days of billiards only men were permitted to use the cue. Women were disallowed because table owners believed they would snag the cloth on the table and ruin it. On the original billiards table, the walls or rails were completely flat; their only function was to prevent the balls from toppling over the table. These table walls closely resembled river banks, and players began to discover that they could use these walls or banks when playing. Thus the term “bank shot, which occurs when a ball is made to rebound off of a cushion as part of the shot, was born. After the year 1800, billiards equipment began to improve rapidly thanks to the Industrial Revolution, a time when improvements were made in much of what we use today. Chalk came into play on the cue sticks as a way to reduce the friction between the cue stick and the ball. This, interestingly, happened even before the cue sticks had tips. In 1823, the leather cue tip was invented, which allowed players to put spin on the ball. Visitors from England showed Americans how to use spin, which is why that spin is now known as “English” in the United States but no place else. The two-piece cue stick was patented in 1829, and slate became a popular material for billiard table beds in about 1835. In 1845, thanks to Goodyear’s 1839 discovery of a process for the vulcanization of rubber, that rubber began to be used in the cushions of billiards tables. For billiard tables, a two-to-one, vertical-to-horizontal ratio of length to width became standard in the 18th century. Prior to that, there were no fixed table dimensions in place. However, by the year 1850 the billiard table had basically evolved into the form we know today. From 1770 until about 1920 in England, the dominant game was English Billiards. This game was played with three balls and six pockets on a large rectangular table. This English tradition is still carried on somewhat today thanks to the game of snooker, a complicated and vivid game that combines both offensive and defensive tactics. Snookers is played using the same equipment that was used to play English Billiards, but with 22 balls instead of three. The Brits’ love for snooker is similar to America’s love for baseball or football, and if you were to visit Britain chances are you would see a game being played in the local pubs or even on the telly. In America, at least until the year 1870, the most popular form of billiards was known as American Four-Ball Billiards. This game was played on a large (usually 11 to 12 feet), four pocket table with four balls, two of which were white and two of which were red. This was a direct descendant of English Billiards. Points were scored by pocketing the balls, scratching the cue ball, or by making caroms on two or three balls. A “carom” is the act of hitting two object balls with the cue ball all in one stroke. With many balls, there were many different ways of scoring in American Four-Ball Billiards, and it was feasible to make up to 13 pints on a single shot. American Four-Ball Billiards produced two descendants in terms of billiards games, both of which exceeded 4-Ball in popularity by the 1870’s. One of these games was a simple caroms contest played with three balls on a table with no pockets. This was game was known as “Straight rail,” which is considered the father of all carom games that have since been invented. The second popular game became known as American Fifteen-Ball Pool, which was the predecessor of modern pocket billiards. The term “pool” in American-speak means a collective ante or bet. However, although many card games and other forms of gambling involved a pool—such as poker—it was to pocket billiards that the name was given and it stuck. In fact, although the term poolroom now means a room where pool tables are housed and played upon, in the 19th century a poolroom was considered a betting parlor, where people would bet on horse races and the like. In these betting parlors, pool tables were introduced so that the patrons could whittle away the time between races. As such, the two activities became intertwined in the public eye, and while the poolroom got a nasty reputation as an unsavory place, it was actually because of the betting that occurred inside and not from the billiards also being played there. Fifteen-Ball Pool was played with 15 object balls, numbered 1-15. Originally, a player would receive the point total on the ball for every shot made, but because that gave an unfair advantage to the first player, this was later changed and instead it was the number of balls pocketed, and not their total point value, that was counted. This latter game, called Continuous Pool thus replaced Fifteen Ball Pool as the competitive game of the age. In this game, the player who sank the last ball of a rack would break the next rack and his point total would be kept “continuously” from one rack to the next. The game of Eight-Ball Pool was invented shortly after Continuous Pool in about 1900, and Straight Pool followed in 1910. Nine-Ball, which is very popular in the competitive ranks today, was probably invented about 1920 or shortly thereafter. Today, while the term billiards sometimes refers to all games played on a billiard table, with or without pockets, there are some that make some very important distinctions. 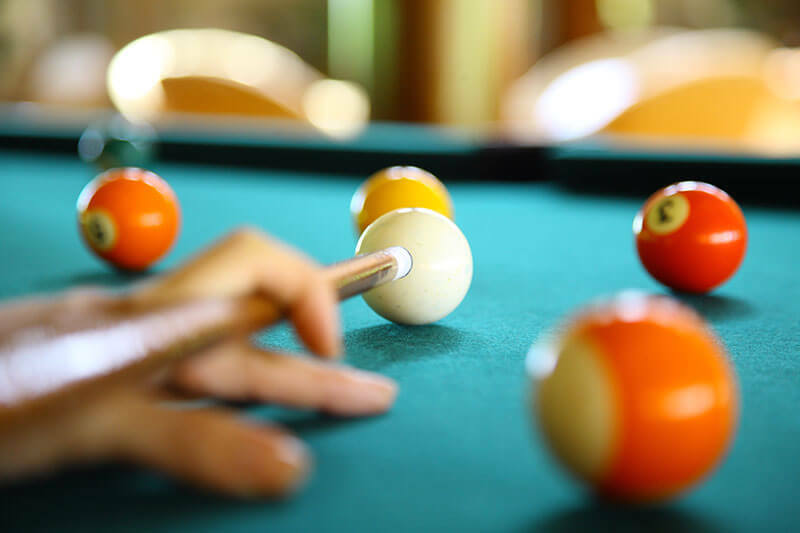 Officially, billiards is now a term that refers to most of the carom games we know today, while pool has become common-speak for all games that use a pocket-style table.